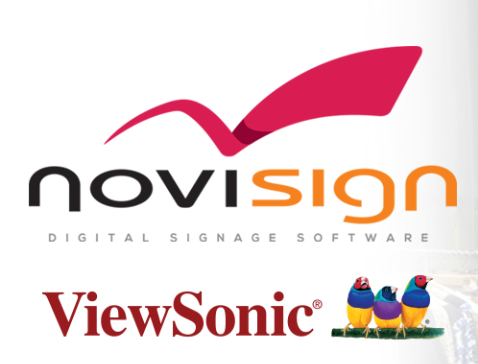 NEW YORK, August 23, 2018 – NoviSign Digital Signage and ViewSonic Corp today publicized a strategic partnership that will promptly enrich their industry-leading commercial display and digital signage offerings. Available today, this relationship offers a new set of tools that streamline digital signage content design, management and deployment. From free-standing all-in-one digital signage kiosks to large format ultra 4K displays and pro-grade media players, NoviSign’s market-leading all-in-one digital signage software and widgets runs natively on ViewSonic’s full line up. From displays in school’s lobby to beautiful freestanding HD kiosks, ViewSonic and NoviSign offers schools a variety of digital signage solution options. Use NoviSign’s digital signage software for education to create media-rich content that features school announcements, media slideshows, HD videos, campus notifications and more. Create a template from scratch or customize a professionally designed template. Combine ViewSonic’s interactive kiosks and displays with NoviSign Digital Signage to create eye-catching digital menu boards and kiosks. Simply purchase SW-095 (12-month license) or SW-096 (36-month license) per device and a ViewSonic display or kiosk. Using NoviSign’s software, restaurants can easily and quickly create beautiful digital menu boards, edit prices, add images, item descriptions, scrolling text, slideshows and videos. All changes wirelessly update the menu within minutes. Founded in California in 1987, ViewSonic is a leading global provider of visual solution products. As an innovator and visionary, ViewSonic keeps the world connected with a portfolio of professional level visual solutions that enhance the way we compute, collaborate, communicate and connect. Our products include LED monitors, interactive commercial displays, touch displays, projectors, a thin client, zero client and smart displays. To find out more about ViewSonic, visit viewsonic.com. NoviSign has over 20,000+ screens deployed across 5 continents that are all powered by NoviSign. Notifiable clients include Disney, Ikea, Dole, Philip Morris, NASA, Nokia, Ferrari, Papa John’s Pizza and more. Using NoviSign’s comprehensive web-based digital signage software online Studio, you can create beautiful digital signage. With over 20+ drag-and-drop widgets to choose from, you can quickly design and manage engaging content that features live social media streams, data-driven polls, fun interactive games and media-rich zones that feature videos, RSS feeds, HD images, scrolling text, weather and more. To learn more about NoviSign, visit www.novisign.com.